Synopsis: Game Of Throne’s final season has begun and we are not holding back on spoilers. 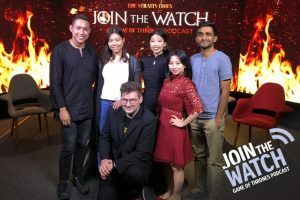 Host Jonathan Roberts is joined by ST’s Olivia Ho, Melissa Heng, Jan Lee, Hairianto Diman and S Sakthivel. The team discusses the highs points, the spoilers, the dragons, the reunions and the potential shipping (as the kids say). All that and even more theories for what is to come. Have we seen the seeds of ‘The Mad Queen’ finally germinating? That’s as much as we’ll say here. You’ll have to listen to get the spoilers. The final season of Game Of Thrones premieres in Singapore on HBO (Starhub TV Ch 601/ Singtel TV Ch 420) and can be streamed on HBO GO app.